The common thread for sales and marketing alignment relates to leads: qualification, hand off, common performance indicators, etc. These are definitely must have on-going, discussions for every B2B complex sale organization. However, we’ve seen a rise in a focus on sales enablement and productivity…a strong theme for 2015. I believe that this year we will find that marketing’s role can extend into and work in conjunction with sales operations for increased revenue contribution. Sales responsiveness is critical to closing deals. Not only does this demonstrate a customer focus to a prospect, but sales can have greater influence in setting the tone of the conversation early on. Prioritization of highly engaged leads has been recognized in the latest iteration of the waterfall model by SiriusDecisions. Regardless of the operational sophistication, your marketing organization should try to shortcut highly qualified marketing leads through the process to the right sales person. If you haven’t already, developing a buyer’s persona will help anyone in the company understand who is a ‘hot’ lead and make the appropriate handoff. For the operational side, you can quantify high value prospects, individuals or organizations. If you are using a marketing automation solution, leveraging and tweaking the lead scoring model can provide some level of mass assessment on this front. Also, prioritizing or highlighting the hottest leads from marketing by adjusting the lead views can increase the opportunity for sales to jump early on in a conversation to quickly close deals. These are the small types of adjustments which can improve sales enablement with marketing. Successful sales reps develop amazing cadence as they work though prospects. Changes to that rhythm become a primary driver for resistance in adopting new processes. Based on my past experience of monitoring prospectors in a demand gen process, sales spends nearly 1-1.5 hours ensuring everything is captured in a CRM system. And that’s even when the CRM is already optimized. Sourcing information that helps sales understand the context for the lead/prospect. Also, marketing can discuss how to continuously improve delivering higher quality leads back to the sales process. Dashboarding all information and access to common tasks. Workflows can eliminate more process clicks and deliver greater data consistency. In any case, watch your reps in action to learn how they engage with prospects and systems before making any operational tweaks. For a qualified lead, the better the conversation, the greater chance for an appointment or opportunity. While marketers are rolling out smart content marketing strategies, that energy and focus should apply with sales. According Corporate Executive Board research, 57% of the buyer’s journey is completed before the buyer talks to sales. If so, then sales would greatly benefit from knowing what and how the buyer has been researching and engaging with their content. The Sales team are always looking for great information not only about the market, but about their prospects. For those who leverage marketing automation, many offer the ability to embed or sync visibility of your prospect’s engagement and actions into your CRM. Armed with that intel, reps can deliver a tailored value proposition and conversation relevant to the prospects perspective. Responsiveness factors into the front-end of the B2B sales process. Sales enablement provides the support on the tail-end. Give your sales reps the ability to ‘drop’ a prospect into a nurturing process. This can be done either through the marketing automation, predictive personalization powered CMS and CRM integration or develop a process to partially automate this. This future follow-up helps ensure no potential prospects fall through the cracks and adds a humanistic determination based on the conversation above and beyond the digital body language. 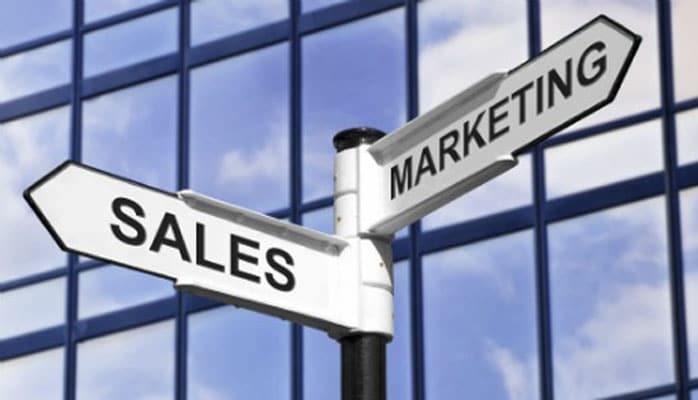 Marketing and sales technology vendors overlap at many events and outreach efforts. Each group will end up learning more about the other’s options. So, it never hurts to recommend intelligence and enablement tools, such as SalesLoft, Insightpool, Breakoutroom (an investor) and Nudge (beta) for your sales team. It’s a gesture which can both open up the appetite for change as well as greater respect toward alignment. As the marketing and sales technology landscape becomes more fragmented and greater in number, it never hurts to hire the right talent or leverage an outside marketing technology firm who can help transform and evolve the total digital customer experience. Besides leads and content, where else have you found Sales productivity improve from marketing operations support?